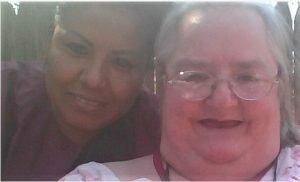 Darlene Franklin her and care aid, Maria, pose for a selfie under a shade tree during our interview on Lit Up. Listen here to the inspiring story on Lit Up Talk Radio. Angela Breidenbach, host of Lit Up Talk Radio, visits with Darlene Franklin about how her career actually blossomed after she lost her independence and had to move into a nursing home, her publisher closed, and her agent dropped her. That would be enough to stop anyone from believing they had something left to give. And then it happened… listen to Darlene tell us how all that devastation turned around and how she managed to have a stronger career in publishing AFTER moving into that nursing home! The question hangs in the silence…what would I do in those same circumstances? Is my life as I knew it over? Or is it just beginning? What’s holding you back from embracing your creative dream? Captive Brides: Journey along as nine historical women are about to make their escape from some of life’s greatest challenges. Can their captive hearts be freed to dream, to dare, to love? Mermaid Song Noble Prescott is drawn to the scene of a shipwreck by a sweet song sung in a language he didn’t understand. The songstress is barely alive, holding onto a piece of the ship’s railing. Previous Article Previous Article: What’s Patriot’s Day and Patriot Day?